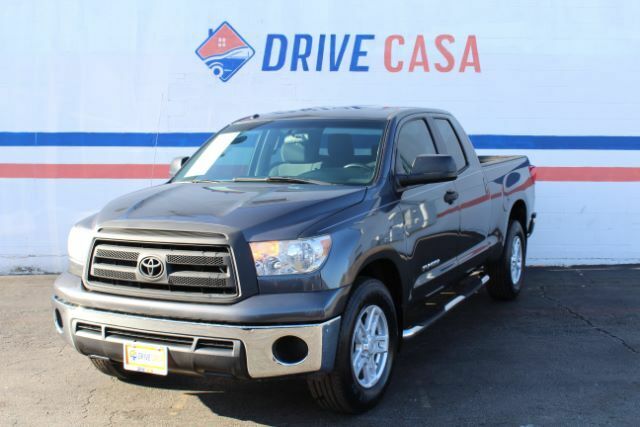 Few vehicles command the same kind of attention as our 2012 Toyota Tundra Double Cab RWD decked out in Magnetic Gray Metallic. The 4.6 Liter V8 provides 310hp while tied to a smooth 5 Speed Automatic transmission. This Rear Wheel Drive will get your blood pumping and provides you with 20mpg, better fuel economy than most other large trucks. Chrome bumpers and 18-inch wheels, running boards, and a drop-in bed liner highlight the exterior. Stylish gauges, practical buttons and front reading lights are appreciated in the cabin. Full power accessories, cloth seats, a split bench seat, and a 4 speaker sound system work hard so you can get the job done. Just try to suppress the smile on your face as this truck works smoothly through its gears, propelling you down the road. Built in the U.S.A, our Tundra leads the pack in safety thanks to intelligently designed antilock brakes, stability/ traction control, trailer sway control, and numerous airbags. Print this page and call us Now... We Know You Will Enjoy Your Test Drive Towards Ownership! Here at Drive Casa we pride ourselves on customer service and quality vehicles. As one of the premier Buy Here Pay Here dealers in Texas, we are passionate about helping people with poor credit or no credit at all get financed through our in-house program. Every vehicle comes with a 12 month/12,000 mile limited warranty. To top that, oil changes are on us for the first year of ownership! Stop by or call us today! We are here for you! Aqui en Drive Casa nos enorgullecemos de servicio al cliente y vehiculos de calidad. Como uno de los distribuidores principals de Buy Here Pay Here en Texas, nos apasiona ayudar a las personas con mal credito en lo absoluto o ser financiados a traves de nuestro programa interno. Cada vehiculo viene con una grantia limitada de 12 meses / 12,000 millas. Por encima de eso, los cambios de aceite estan a nuestro costo el primer ano de propiedad! Venga o llamenos hoy mismo! Estamos aqui para ti!